When I first heard there were Bluetooth speakers on the market, I didn’t take much notice. After all, I already had a home theater, a good stereo system in my car, and a smartphone paired with some headphones. I had all the gadgets I needed, and getting a Bluetooth speaker, at the time, didn't seem practical or necessary. It's not 2018 and today, I have several Bluetooth speakers. So, if you don't understand Bluetooth speakers are popular, the following may change your perspective. From one audiophile to another, I guarantee that a Bluetooth speaker will be one of your favorite carry ons. If you have heard of the wonders of having a Bluetooth speaker and are looking to own one, this article is also home for you. 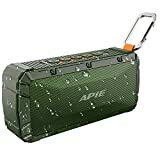 After a thorough review of Bluetooth speakers on the market and a critical study of customer reviews and experiences, we have resolved that the Apie Portable Wireless Outdoor Bluetooth speaker is the best there is in the market. The Apie Portable Wireless Outdoor Bluetooth speaker is the speaker that not only looks good on paper but also lives up to expectations with its impressive performance. It is easy to see why this Bluetooth speaker is so popular and its manufacturers are on their heels trying to keep up with the demand. This speaker has set itself apart from the competition with unique features, an attractive exterior, and superior performance. Looking at the market, some manufacturers dwell on lighting, others style, others durability, and others dwell on performance. However, the Apie Outdoor speaker has majored on all these qualities and achieved perfection. The first thing you will notice when you lay your eyes on the Apie Outdoor speaker is that it is extremely small. At only 6" by 2.7", this speaker is approximately the size of two snicker bars put together. Regarding its design, Apie Outdoor is attractive and even better than you expect at its price. Apie took on an OD green theme and a little orange here and there. The covering is unique and durable. The grille is large but well executed into the design, giving it a military-like look that highlights the aggressive design. The combination of rubber and metal on the exterior is a perfect balance of flexibility and rigidity. The Apie speaker has a flexible clip that allows you to fix it to your bicycle or bag instead of having to carry it with your hands. It is unlikely that weight will be an issue when handling this device. The speaker weighs less than a pound, making it great for camping, hiking and for other outdoor activities. Every hiker or parent that has gone out for a picnic with the family will tell you that ounces and ounces turn into pounds very easily. Therefore, having a light speaker will ensure that your load is not made heavier as you walk through long trails. Looking at the exterior alone, this is truly an impressive speaker; the masterpiece you would imagine an outdoor speaker would be. However, beauty is only skin-deep, and we had to conduct more tests. Apie Outdoor performs even better than you would expect. With only two drivers, you would not expect an experience as stellar. This speaker is proof that small relatively cheap speakers can deliver a good performance. 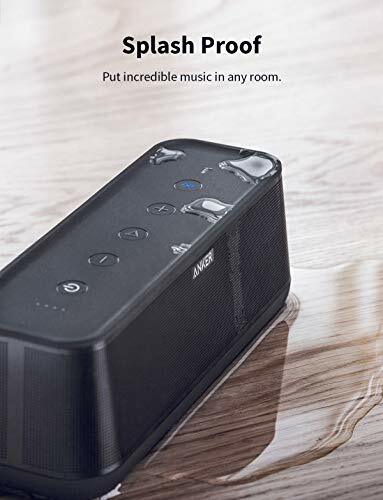 The buttons on this speaker allow you to use it as a remote control for your phone because you may use them to skip a track, pause the music, and any other action needed to navigate your playlist. AVRCP Bluetooth connectivity allows the speaker to be used as for calls. If a call comes in, you only have to press a button, and the inbuilt microphone will facilitate a hands-free conversation. You can also hold the answer button to start your virtual assistant, Siri. Features like these make the speaker an extension of your smartphone rather than an isolated accessory. IPX6 technology means that the speaker is waterproof, such that it can take a splash here and there, but should not be submerged in water. For its size, the Apie outdoor speaker has a surprisingly rich bass. However, this base is not of the same quality as what you would get from a large speaker that has drivers that can move large amounts of air, making the bass feel more precise and tighter. You will notice an audible difference between one speaker and the other. On the Apie Outdoor speaker, the tones are less complex. You will still hear the bass, but the definition and resolution of the sound are different. If you are considering size in your purchasing decision, then this is the best you will find. You can get this speaker for around $15-$30. When looking for a speaker in this price range, it is easy to note that some speakers have more features than others do. The next thing is to determine the suitability of the features to where you intend to do your most listening. These intentions are then weighted against the strengths and weaknesses of the speaker and of your personal needs. The most basic needs, however, are battery life, and sound quality. 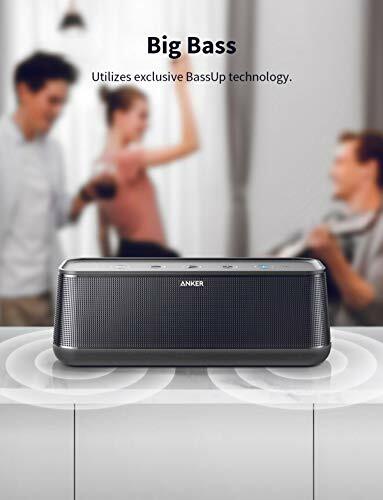 Anker has diversified its production from manufacturing batteries and added a range of electronics among them, the Anker Soundcore Pro+. Most of Anker’s products are expensive except this one. However, it tops in terms of sound quality. The Anker Soundcore Pro’s physical design is standard: black rectangular body sitting at 8" by 2.8" by 2.7" The thick base provides a strong and stable build. Its metal casing and controls are large and clear, making it obvious to operate the speaker at a glance. 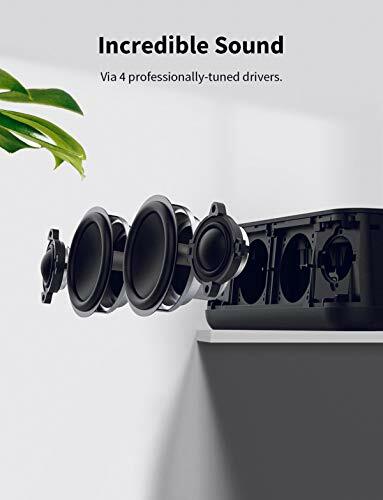 Besides the powerful metallic build and the heavy weight of the speaker in your hands, it is already clear that this speaker almost indestructible. Another feature unique to the Pro+ is its rounded design. This design enables the speaker to produce sound in a 360-degree range around the speaker, making it great for listening from any direction. Unfortunately, this speaker has a smooth, glossy surface that attracts visible fingerprints. However, this is quickly countered by the waterproof nature of the device courtesy of the IPX5 technology. Other features include a 3.5mm jack and USB charging port covered by a rubber panel on the backside of the speaker. This rubber panel also protects the speaker from getting water inside. In case you do not intend to have a wireless connection, these port and jack are another way to connect the SoundCore Pro+. The battery life for this speaker is longer than that of the Apie Outdoor speaker. 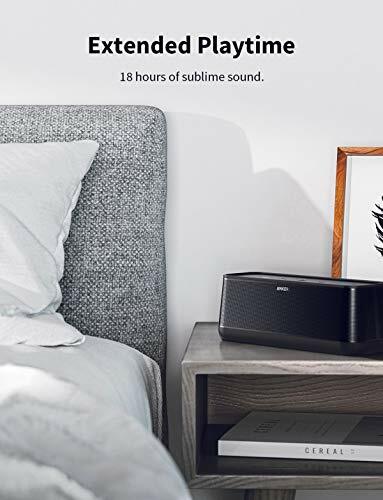 The SoundCore Pro+ lasts up to 18 hours. When tested, this battery estimate proved accurate, courtesy of its large 8000mAh Li-ion rechargeable battery. This large battery contributes to SoundCore Pro’s near two-pound weight. The speakerphone on this device is also accurately described. It produces a highly accurate sound that makes it easy to hear people talking on the other side. However, the microphone is not as good; the sound quality is like that of a smartphone. The price of the Pro+ is considerably high, and in a range, you would expect to see speakers taking the microphone design. Having more speakers makes a speaker better equipped to receive voice commands especially when playing content and taking commands simultaneously. Speakers of this caliber are expensive, which makes the SoundCore Pro+ even more special. 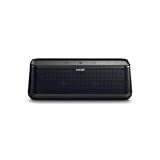 When compared to the Apie Outdoor Bluetooth speaker, each has its strengths and weaknesses. For example, the SoundCore pro has a longer battery life, and its speakerphone produces quality accurate and better sound compared to the Apie Outdoor. However, what is of most interest in a speaker is the quality of sound it produces which brings both speakers to a level playing field. Since both produce good sound, then the pocket-friendly option is a better bargain. Besides, the Apie has a more attractive, has a lighter body and would be cumbersome to carry around due to its weight and the fact it must be carried by hand. This speaker is bound to catch your attention immediately from its exquisite design. Fortunately, it matches this beauty with excellent performance. The ECOXGEA ECOXBT is 100% waterproof courtesy of acoustic engineering and sealed enclosures. Its polycarbonate outer shell and rubber mold also add shock resistance to it while the grill cover over the speaker protects the cones from damage. Its inbuilt Li-ion 1800mAh battery supports up to 10 hours of unplugged sound and uses a USB cable and power adapter to charge or play from your laptop and wall power. The speaker also recharges quick, in about 2 hours. This speaker also seamlessly connects to your tablet, laptop, smartphone and other Bluetooth-enabled devices using the standard A2DP or the integrated auxiliary jack. The ECOXBT has an excellent wireless Bluetooth speaker and a perfectly clear speakerphone. 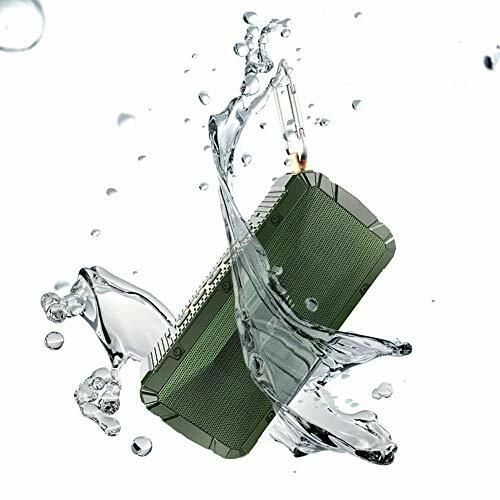 The built-in waterproof microphone allows you to enjoy hands-free calls anywhere. 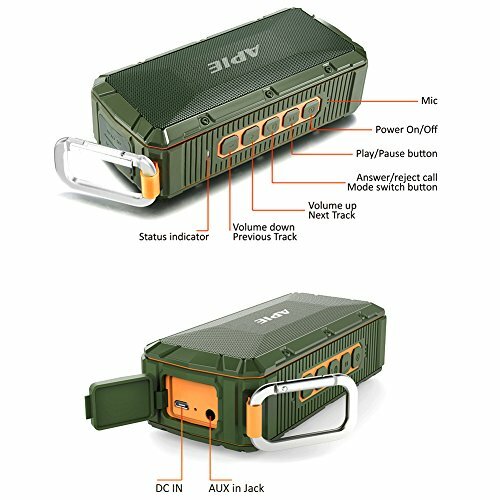 This speaker comes with a detachable carabineer you can clip on your backpack to keep your hands free. You can clip it to a tree or a tent when camping. 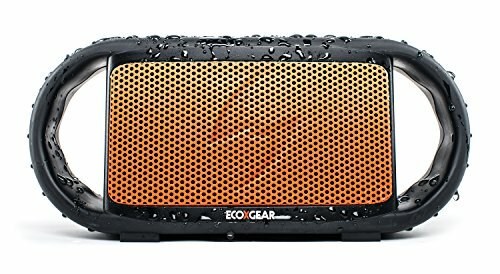 The ECOXGEAR ECOXBT almost has equal benefits as the Apie Outdoor Bluetooth speaker. From the attractive design, 10 hours of play time, water-resistance, a carabiner to attach the speaker to a backpack, tough exterior material, connectivity, and performance. Both speakers are suited for an active outdoor activity and do not need to be held all the time. Since these speakers have the same performance level, pricing becomes the distinguishing factor. The Apie Outdoor speaker is cheaper, which will give you value for money. The Apie Outdoor Bluetooth speaker is an excellent device and a smart buy. It is affordable, durable and waterproof, has an attractive body, and performs beyond expectation. The Apie will offer you plenty of value for its price. This speaker will surely change your mind concerning Bluetooth speakers. Overall, this is a competitive speaker, in all ways, in a highly saturated speaker market. 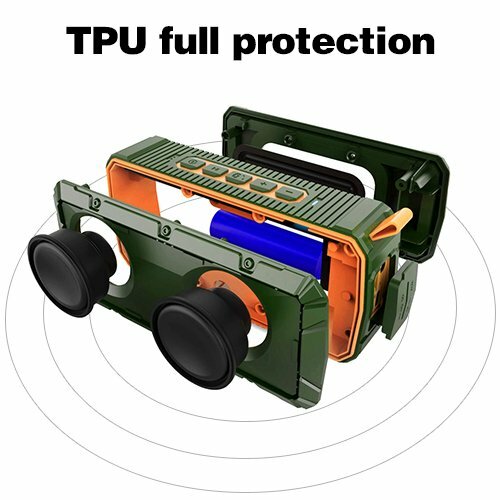 The Apie Portable Wireless Outdoor Bluetooth Speaker is very portable to ensure that you do not miss your sound and it has a surprisingly rich bass. However, this base is not of the same quality as what you would get from a large speaker that has drivers that can move large amounts of air, making the bass feel more precise and tighter.